No. 12 Florida Gators baseball ended a rough week on a high note by sweeping its third-straight Southeastern Conference home series. It looked like any momentum Florida had from last week’s sweep of Georgia had faded when UF dropped back-to-back mid-week home games to the Jacksonville Dolphins (3-1) and Florida A&M Rattlers (4-3). 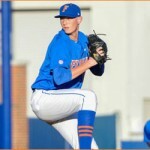 The Gators (30-15, 15-6 SEC) managed to turn things around over the weekend against the Missouri Tigers (19-24, 6-15 SEC), complementing standout performances on the mound with terrific run support at McKethan Stadium in Gainesville, FL. A pair of rookies carried Florida to a 7-1 win over Missouri in Friday’s series opener. Freshman right-handed pitcher Logan Shore (7.1 IP, 5 H, ER, 5 K) kept the Tigers off the board for seven full innings in a strong outing. He has now managed to go at least five innings in all 10 starts this season. Helping Shore at the plate was classmate and designated hitter Peter Alonso (3/4), who matched a career-high with five RBIs. Shore’s stellar outing was not the Gators top pitching performance of the weekend. Sophomore RHP Aaron Rhodes (9.0 IP, H, 2 BB, 6 K) outshined his teammate and UF’s budding ace with a complete-game one-hit shutout in only his third start of the season. The reliever-turned-starter got plenty of run support with junior second baseman Casey Turgeon (2/4, 2 RBI) helping send the Gators to the 5-0 victory and series win. Down but not yet completely out, Mizzou refused to go quietly in the series finale. Florida jumped out to a 2-0 lead in the first inning but quickly fell behind 3-2 in the second. The Gators managed to knot things up with the Tigers twice, forcing extra innings as they hoped to pull away with the sweep. It was junior first baseman Zack Powers (2/5, R) who stepped up for UF in the 10th, managing a two-out single to center field and subsequently stealing second base to put himself in scoring position. After freshman DH A.J. Puk (1/2) was intentionally walked, freshman left fielder Ryan Larson (2/2, RBI) came through in the clutch for his team with a single to center that scored Powers for the walk-off 6-5 victory. I am wondering if our mid week woes are just a lack of quality starting pitching outside the weekend rotation. Either way its all about winning series. Go Gators. Sully attributes it to youth. The youth factor might mean a lack of focus – which is believable. Fortunately for Florida, wins over good teams (LSU, FSU, USC) mean a lot more in RPI than losses to bad teams (FAMU). While sweeping Georgia and Missouri was nice let’s not kid ourselves. The Bulldogs and Tigers are the worst teams in the SEC and are both below .500. The next 2 weekends will be the true measuring stick for UF. Well, in all fairness they have already completed a season sweep of the #1 team in the land, all during mid week contests no less. I just can’t figure out this team. It’s maddening, but certainly not as maddening as last years debacle. Hopefully they continue to play up to quality competition as that will bode well for the regionals and super regionals. While they did sweep FSU they also lost to a very bad FAMU for the first time in 19 games and a JU team that has lost almost twice as many games as it has won (14-25) and they didn’t even look good doing it. Just when I think this team has turned the corner, it goes out and craps the bed. Three steps forward, one step back. Bama and Vandy will give this team all it can handle. They could just as easily go 6-0 as 0-6. Either way, we’ll find out if they are contenders or pretenders over the next 2 series. The team’s resume is already impressive by going 8-1 against FSU, LSU and South Carolina. Bama and Vandy won’t be easy, but I don’t think anyone is pretending UGA and Mizzou are the team’s defining wins. I’ve seen ALL of their televised games so far this year & they’ve been brutal at times (Illinois, FAMU) & very good other times (FSU, LSU giving Nola his lone loss, & UGA with Rhodes masterful) but gatorboi is right. They’re too hard to figure out, so, “the jury is still out” for me. Sully said it best last week after that 1st ever loss to FAMU by basically stating the obvious that he can only do & say so much & that “it’s up to the players”. Suggesting they’re “not that into” mid-week games but get up for “big” games & SEC games is nice in theory but a poor excuse. Nevertheless, Sully has been GREAT with his pitching staff in developing Shore & Rhodes & moving Poyner to the pen. Their lineup is just OK. Gushue is having a great year but Turgeon needs to catch a break. He almost never strikes out & ALWAYS seems to hit “atem balls”. They’re 12-6 in 1-run games but 3 of those loses came against FGC, FAU, & FAMU yet SWEPT LSU (road), FSU, & took 2 of 3 in Columbia!?! Go figure! Regardless, the math for the stretch run is pretty simple. If they can beat Bama twice & win 5 of their remaining 9 conference games they’ll WIN THE SEC!!! (cause USC will NOT win 8 of 9). Who saw that coming before this season?